For the villages in Azerbaijan, see Soru, Azerbaijan and Sors, Azerbaijan. The underside of a fertile frond of Dicksonia antarctica. Each circular brown structure is an individual sorus. A sorus (pl. 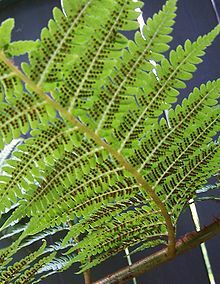 sori) is a cluster of sporangia (structures producing and containing spores) in ferns and fungi. This New Latin word is from Ancient Greek σωρός (sōrós 'stack, pile, heap'). In lichens and other fungi, the sorus is surrounded by an external layer. In some red algae it may take the form of a depression into the thallus. In ferns, these form a yellowish or brownish mass on the edge or underside of a fertile frond. In some species, they are protected during development by a scale or film of tissue called the indusium, which forms an umbrella-like cover. Sori occur on the sporophyte generation, the sporangia within producing haploid meiospores. As the sporongia mature, the indusium shrivels so that spore release is unimpeded. The sporangia then burst and release the spores. The shape, arrangement, and location of the sori are often valuable clues in the identification of fern taxa. Sori may be circular or linear. They may be arranged in rows, either parallel or oblique to the costa, or randomly. Their location may be marginal or set away from the margin on the frond lamina. The presence or absence of indusium is also used to identify fern taxa. Wikimedia Commons has media related to Sorus. Sori with indusia at different stages of development. Fungal sori of the Meadowsweet Rust gall. DiversityOfLife – Fern identification tool. Encyclopædia Britannica: sorus 2007. Encyclopædia Britannica Online. Retrieved 20 November 2007.